Mass. Congressman Barney Frank Looking Forward to Earl Coming Up The Backdoor. BOSTON, MA - Massachusetts officials ordered the state-wide evacuation of all citizens today in anticipation of a possible strike by Hurricane Earl. 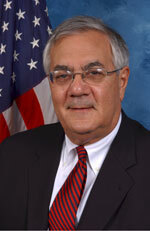 Congressman Barney Frank said that he was looking forward to seeing Earl coming in the back door of Massachusetts. Attorneys from Payne, Fear, Weiner and Cox threatened to sue the pants off of Congressman Frank. The vision of a naked Barney Frank was the primary impetus for the unusual evacuation order by state officials. Citizens of Massachusetts were thankful that their elected officials took quick, decisive action to protect the citizens from such a costly, painful and embarrassing ordeal.